Having just arrived in Lima, Liz is given the traditional welcome at Mi Carcochita, in Lince. Those are my cousins Diego, on the left, and Juan Ramon. 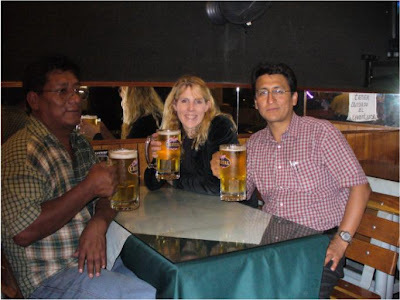 "We´re in Ayacucho, having arrived on a flight that got us here at 6am. "As it is Sunday, the town was still sleepy and it took us about an hour and four stops to get a cup of coffee and chaplas con huevo. Cafés either weren´t open or they didn´t have bread or they didn´t have coffee or the water wasn´t hot yet...finally our success came the second time we stopped at a stall in the mercado. "Here I am now. Having a great time, but still thinking of you all. 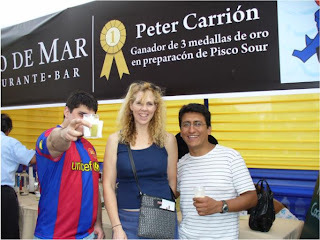 Yesterday was El Dia del Pisco and we celebrated like true peruvians, drinking all types of Pisco drinks at the festival in the park in Surco. We collected a whole bag of cups from the different distilleries, and Danny and I made a purchase or two. "Poor Toya and Willy..we stopped off to have cuyes afterward, but as we were all thoroughly wasted, I don´t think we were good for business, as we had the table right up front. There was talk of karaoke or dancing, but we all went back to the resi and to bed, having to get up at 2:45 to leave for the airport. Ughh. "The plane had 20 seats...very small, but we were all so tired, we slept (with the addition of some rhythmic snoring from Juan Ramon). I woke up about a half an hour later to a beautiful sunrise over the Andes."